The Power of the Dark Crystal #4 Review – AiPT! The adventure continues in The Power of the Dark Crystal #4, as Aughra warns that prophecies are tricky. We seek a full understanding of their meaning, but they are “twisted” things. Is the prophecy as black and white as we believe? The story takes a few turns in this issue that will have you wondering what is right, what is wrong, and whose side you should be on. 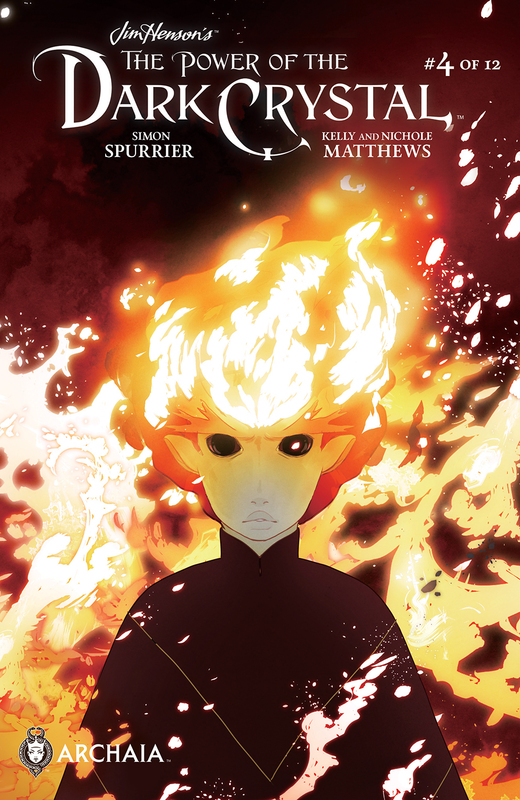 This issue is laden with themes of perception and sight, starting with the cover and Thurma’s fierce eyes with reflected flame. We think of Thurma as a child, but these are not the eyes of a child. The tension in her face combined with her frozen stare make her look formidable and far beyond her years. By the cover alone you begin to question–is Thurma good or bad? 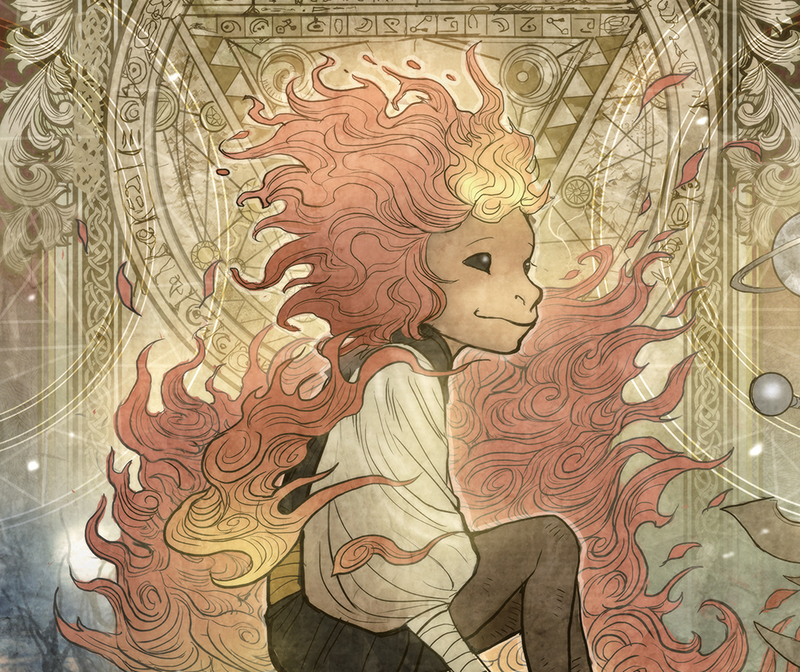 Thurma has not swayed from her main mission of saving her people and being a child is not as open to considering other consequences. She is cavalier about the physical damage she has caused to Thra. She cares not that the castle is in havoc or that the Skeksis have been set free. She is blind to everything but her cause. Kensho on the other hand sees more clearly in this issue. He battles with himself about if he is doing the right thing by helping Thurma. His doubt comes across on the page with sidelong glances and downcast stares. He begins to question the integrity and motives of his own people the Gelfling, especially when confronted by them. Who’s to say what is right and what is wrong? How can saving a species be wrong? Kensho is good hearted and feels at his core that helping Thurma is the right thing to do. He also feels a new connection. We are reminded that the world of Thra and its many inhabitants are steeped in lore. Aughra’s predictions from the stars and ancient stories passed down for generations guide their every action. Could one of these ancient tales apply to Thurma and Kensho as well? The Mystics have once again assumed a passive role and the Skeksis continue to bicker and feud. Jen and Kira decide that perhaps sitting for 100 years wasn’t the right way to rule. They need to see what is happening outside the castle walls and not simply rely on faith. The fate of their ancient world is hanging in the balance. Not everyone wants to keep with tradition, though, and that may just be what saves Thra. The characters and the storyline are developing quite well. Each issue seems to deepen the personalities of newer characters like Thurma and Kensho while the more familiar characters have fallen right into step. Aughra is a fantastic, feisty force. Chamberlain is devilishly conniving. Jen wants to set things right and Fizzgig rides again. Did I like it? Emphatic yes. Whether you are a fan or a newcomer, you will love this fantastical battle for good and evil. Mystical goodness that is sure to delight.